Thanks a lot spaz. You are truly the wiki of F-16.net. "Naval aviators from the U.S. and France are training together for the second time this year, anticipating the French navy’s resumption of carrier operations this fall. 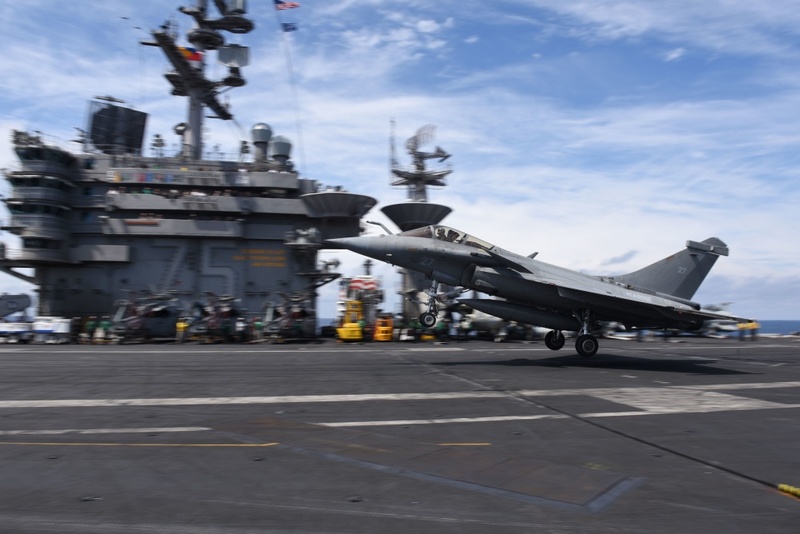 As part of French Air Defense week, French Dassault Rafale M Fighters are participating in exercises with F/A-18E/F Super Hornets and E-2D Hawkeyes from Carrier Air Wing One (CVW-1) embarked aboard USS Harry S. Truman (CVN-75)…. ...The current exercises between the Truman Strike Group and French aviators are occurring over France, over French territorial waters and in international waters in the Bay of Biscay. They are scheduled to finish Friday...."
madrat wrote: Does the Raf orbit faster or slower than Rhino? 18E is faster due to pirouette maneuver. The peak pitch rate acheived by 18E is 80deg/sec. I will post the test report later. F/A-18E and Rafale may have similar initial nose pointing capability, but after the speed bleed F/A-18E can maintain that agility while Rafale can not. Four page PDF of article attached. Prior to each deployment to a carrier, pilots have to perform field carrier landing practices (FCLPs). Opération Chesapeake was no exception and French pilots conducted FCLPs at Naval Auxiliary Landing Field Fentress – a satellite airfield of NAS Oceana – under the supervision of landing signal officers (LSOs) from both nations. “Each pilot underwent a dual validation by French and US LSOs,” explained the commanding officer of Flottille 17F. “American LSOs travelled to Landivisiau last February to evaluate our performance during FCLPs and ensure we respected strict safety rules. The Marine Nationale decided to send to the USS Bush only highly qualified pilots who had previously been carrier-qualified either on the Rafale or the Super Étendard Modernisé (SEM). 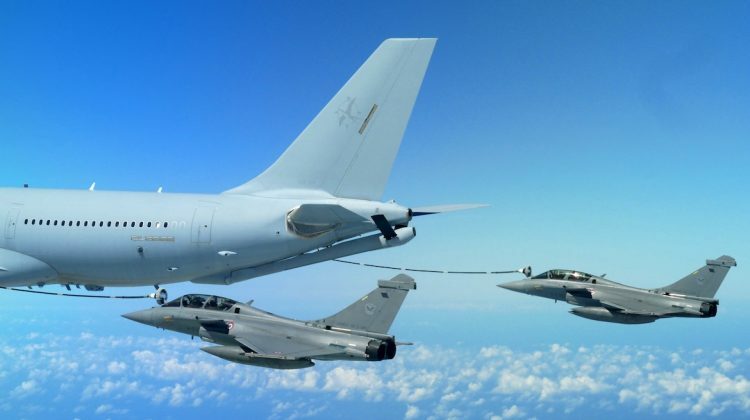 The commander of the French carrier air group explained: “With the transition of Flottille 17F from the SEM to the Rafale, we find ourselves with former SEM pilots with plenty of experience of carrier operations, but with no Rafale carrier landings under their belt. “Once on board USS Bush, they carried out their first trap at the controls of a Rafale, but this qualification is not directly applicable to the Charles de Gaulle. ...During daytime, US carrier aviation procedures are similar to those used by the French, albeit somewhat more rapid: “We modified our carrier circuit slightly in order to follow US procedures,” explained Flottille 17F’s CO.
“While we fly in for the break at 600ft and 280kts in France, here, the break is done at 800ft and 350kts. The US pattern helps accelerate and expedite ‘the flow’. “At night, differences are more pronounced. Our American friends rely on powerful lights to illuminate the flight deck, while on the Charles de Gaulle everything is done in pitch black. This means that US pilots can use hand signals to communicate with flight deck personnel while on the Charles de Gaulle it’s so dark that we instead rely on our position lights to communicate, using specific sequences to pass on our messages. While aboard USS George H W Bush, French pilots had the opportunity to train again with the Improved Fresnel Lens Optical Landing System (IFLOLS), which is now the standard equipment on US carriers to give pilots glide path information in the terminal phase of the landing approach. Most French pilots had already experienced IFLOLS when training on the T-45 at NAS Meridian, Mississippi, and on various flat-tops during their carrier qualifications (carquals). The IFLOLS, first installed on USS George Washington (CVN 73) in 1997, has equipped all US carriers since 2004, and was added to the Charles de Gaulle during her 2017-18 refit – replacing the French-designed OP3 (Optique Principale de 3ème Génération; third generation main optical landing system), which had become increasingly difficult to support and maintain. “Compared to the OP3, the IFLOLS proves more precise and more user-friendly,” the commander of the French carrier air group told AFM. While the RAAF’s F-35As are not present at the 2018 Pitch Black, Air Commodore Kitcher said the aircraft was a chance to be in the 2020 edition of the event. “They may participate in a very small way in Pitch Black ’20 but by Pitch Black ’22 they will be participating definitely,” Air Commodore Kitcher said...."
"...The exercise [biennial Pitch Black exercise started as a bilateral air combat exercise in the mid-1980s between Australia and the United States, and was named for the dark nights found over Australia’s sparsely populated north] takes place in the sizable military training areas of northern Australia, utilizing one of the largest unrestricted blocks of training airspace in the world that includes the Bradshaw Field Training Area and Delamere Air Weapons Range. This allows for a realistic battlefield environment to be replicated during the exercise that previous participants have said was difficult to find in training areas elsewhere in the world." AirForces Monthly Sep 2018 Issue 366 four page article about SOLO Display RAFALE French Air Force attached below. Also, according to this article, the actual cost per Rafale in the deal is about 267 million USD. Explain? because 526 crore is far from that isn't it? Anw, Congress affirmations have been extensively debunked by IAF, press etc. Of course, if you include modifications of 2 airbases, training, tooling, simulators, lots of weapons including meteor, scalp, a 5 (or 10 cant remember) maintenance contract (75% availability min. ), specific indian modifications on plane... etc. etc. Sitharaman said the Rs 526 crore figure refers to the bare aircraft, capable of just flying and landing, and does not take into account the avionics, arsenal and other associated technologies that make it a complete fighting machine. Sitharaman is the current defense minister. There are similar quotes floating around other Indian media today. Interpretation is up to you, but to me, it sounds like she's saying the Rs 526 number doesn't even include things like radar, EW systems, whereas the Rs 1670 number could include things like missiles and simulators. That's "brutally" expensive but at the same time doesn't surprise me much since it seems to be in-line with other Rafale deals such as in Qatar for example. Or also in-line with reports of being too expensive such as in Brazil where it was considered the favorite among the 3 finalists but discarded apparently on cost basis/reasons alone. Simulators, training equipment, mission planification system etc. 14 modifications specific to India (israeli SATCOM and Helmet (including symbology etc. for new weapons), Modified APU, FADEC (indian conditions), integration of Israeli weapons, modifications of SPECTRA (lower band jammers, Towed decoys), more powerful calculators for MDPU, integration of Indian weapons, specific datalink etc. All in all 8 billion dollars. Little bit of a sneak there from minister in excluding the cost of "India specific modifications". So we are still hazy on the cost of the aircraft with all of the onboard equipment excluding munitions. According to a 3rd source the "vanilla" price is $3.42 billion Euros for 36 aircraft, so then that implies about Eu 95 million ($110.5 million USD) per plane.